Getting engaged is a ton of fun. People congratulate you. You've got something sparkly on your hand. There are unlimited champagne opportunities. 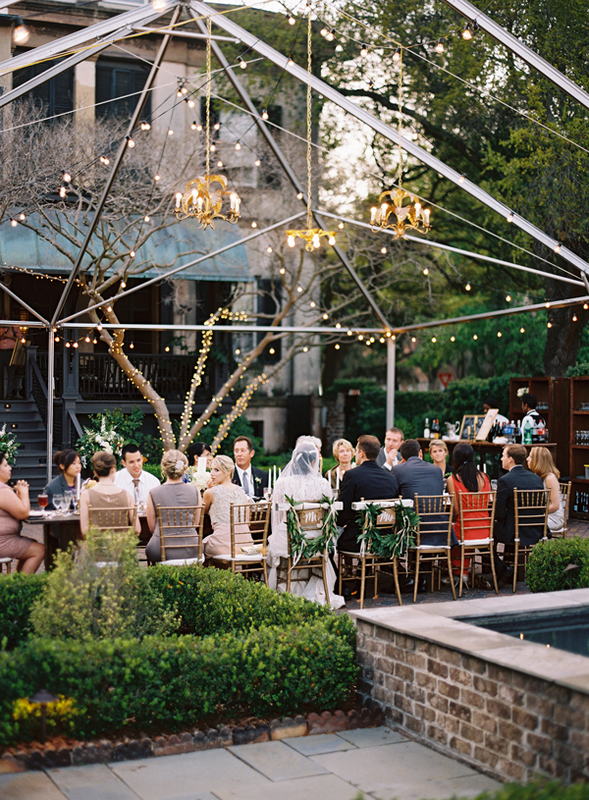 And you're looking forward to this magical wedding you'd always dreamed up. But after that week of all-smiles and extreme joy, there comes the inevitable. What's the date? Where? Who's coming? And people, instead of congratulating you, start peppering you with questions. With requests for invites (it's a thing). With advice on how you should plan your nuptials. And you actually have to start planning this big day, about a year away, with input from everyone around (trust me, this is not just your individual party. There are so many people with so many opinions that kinda-sorta need to be taken into account). We've been going through a lot of big-decision-making recently regarding the wedding and I thought I'd share my advice, so far, on how to handle some of the biggest planning moments. Before you start making any decisions, sit down with your fiance and decide what element of your wedding is the top priority. It'll inform the rest of your decisions. Is being able to invite every single person you know, the key element? A space that fits more than 100 will be crucial (and a decreased food, booze, decor budget will follow). Is the aesthetic of the event the key piece? If so, you'll want a venue that allows you control over vendors, looks unique with lots of natural light, and you'll want to allot more money to your decor budget. Are you a foodie and the food and booze are your #1 priorities? You may want to host your event at a private home where you can have full reign over all of the drink options offered and won't need to pick through a bad wine list. Ben and I decided that the most important part of our wedding was being able to spend a week on the beach with our closest friends and family, culminating in our wedding day! So we had to abandon some of our original venue ideas as they were too expensive to allow us to invite friends and family and focus on getting everyone together in one place. After you've completed this important process, here are some specific decision-making tips. 1. The date. For us, this was the easiest part of the wedding planning process. We wanted it to be on a Saturday at least 10 months, but no more than 18 months away. And it needed to fit in with the med school testing and break schedule. That left about one weekend during Ben's spring break in 2015. Done! If you're stumped and don't have medical school to dictate your decision making, here are some great things to keep in mind. In planning my wedding, 13 months away from when I initially got engaged and started contacting vendors, there were already some booked vendors. I'd not recommend getting married within a year's time of your engagement otherwise you run the risk of your vendors already being snatched up. Some other helpful date ideas for the budget-friendly bride? The off-season (think Nov-Apr and sometimes May) is usually at least 1/2 off the peak-season rate. Hotels and accommodations for guests are also often on off-season rates. And of course, getting married on a weekday or a Sunday, rather than a weekend, is much cheaper! 2. The venue. This big one has caused countless tears in our household. All mine :). We initially started out wanting a really low-key non-venue venue. We wanted unique. Outdoors. Totally customizable. The Parenthood backyard (but actually, is that a thing?). And then we realized that we didn't have a "family estate" or a piece of land to use. And non-venue venues that are actually venues are ridiculously pricey and don't even include the massive chair, plate, table, lights rentals. In making this decision we sat down and discussed what was most important to us about our venue. Keep in mind the following: Is control over the vendors important to you? Some venues require you use in-house caterers, in-house photography, in-house cakes, and in-house florists. Is a venue with a view key? If you're getting married in a city you may want to look for top-floor rooms or waterfront spaces. Is dancing important? Many small venues don't accommodate dance floors. Inevitably we landed on a hybrid of our visions. We will be holding our ceremony on the beach at a private residence and then packing up and heading to a gorgeous beach-side historic hotel for the reception. The room is open air and includes sweeping ocean and city views. A bonus of this space is that the hotel has a great restaurant, basically act as a day-of wedding planner for you, and they are able to outfit your space with tables, chairs, and linens - taking the uncertainty of rentals out of it. 3. The guest list. This is inevitably the worst and most frustrating part of the wedding-planning process. You start off thinking you can have an easy, intimate 20 person wedding with immediate family only, until you realize that there are 20 immediate family members per side. And daily, a new aunt you forgot about pops up with her plus one that needs to be invited. I'd highly recommend making a Google Doc spreadsheet and sharing it with your fiance, his parents, and your parents. Give everyone a free-for all with listing who they'd like to invite in columns titled "Bride immediate family," "Groom immediate family," "Friends," and then an extensive "back-up" column (also known as the people you want to invite, granted there is space). Then look at your venue's space constraints, your budget (guest count will affect your per-head catering pricing and at an average of $80 per head it's definitely something to take into account) and start weaning the list. Things to consider: make sure the sides are balanced out. If you have a massive family but your fiance only has three people on his immediate family list, consider having him invite more of his friends and colleagues so his side is adequately represented. Conversely, pare down your extended family invitees and consider hosting a party after the wedding where you can invite many people for a casual get-together so they can still be included. Finally, don't get caught up in the "I have to invite so and so because so and so invited me" because your guest list will spiral and your formerly intimate wedding will turn into something unmanageable, large and expensive. Make sure your invitees are people you: care about, would be sad if they didn't attend, and are people that would be happy to attend your wedding and not irritated that they have to attend yet another ceremony this year. Ben and I are having a small wedding with under 40 guests. Wish us luck in getting this destination wedding attendee list wrangled. 4. DIY. DIYs are insanely popular right now. I suspect it's partially due to the financial extravagance of weddings, Pinterest's directive to all brides, and the wealth of internet how-to's out there. Before you start googling how-to's and deciding to DIY elements of your wedding, assess your areas of strength and the amount your family can contribute in terms of time and effort. We're choosing to DIY a few elements of my wedding. The first was obvious - I'm hand-writing my wedding invitations, name-cards, menus etc. I have always had good handwriting and just picked up calligraphy to prep for the big day. I feel confident that I can achieve this as we have a small number of guests and I take a lot of pleasure in this as a hobby. We're also choosing to DIY the flowers (ack! ), not because of any particular skill, but purely for cost-restrictions. After looking at florists on Oahu that charge a minimum of $2,800 for wedding florals, we are going the DIY route. Luckily, I have some family friends and family members that are great at floral arrangements. Things we won't be DIY-ing? The food! That's simply too much work for my family on the day-of (and we can't do that at the venue anyway). If you happen to have an extended family and a relaxed venue and want to spend a cook-day in preparation of the wedding, this would be a good idea, but beware extending yourself on your wedding day! I am planning a wedding too - for July of this year. One question I got very tired of (right away) was "what are your colors!?" We don't really have "colors' so much as (like you said) an aesthetic. We really considered a destination/tropical wedding and I am really happy you guys are going that route. It will rock! THE PARENTHOOD BACKYARD! ha love that idea! Most recently, I attended a big cheesy event. This, I was super impressed with. Not crowded at all and excellent grilled cheese options. I'd go again if I had the money to spare. Have fun with the planning. Great post. we were engaged in November, and got married the next May. When we started looking for venues in mid-December (aka 5 months in advance) we had a LOT to choose from. I'd say if you want a specific something, you might need more time ... but if you are open to viewing different venues before deciding, it is possible to get something you love in a shorter amount of time. I had my Dad call all the venues I was interested in (in December) to check for availability for May, and they were all available. It's totally possible! Having just wrapped up all of this for our own nuptials, it is interesting to hear other's thoughts about where to spend and where to save. We were pretty similar, saving on DIY flowers + invitations, and going all out for the right venue + food/drink. We had about 150 on our guest list, and while we enjoyed that size for us, I look forward to seeing your intimate wedding. Enjoy every moment, the past year flew by, but the actual day was about as long as a blink!